West coast of france from Les Sables d'Olonne to La Gironde. Scale: 1 : 109,400. One-minute gridlines. 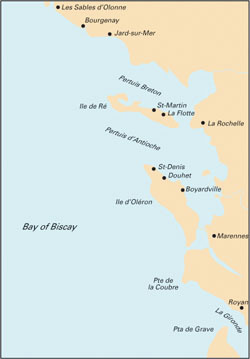 Larger scale plans of Jard-sur-Mer, Bourgenay, Ars-en-Re, St Martin de Re, La Flotte-en-Re, Rochefort, Douhet, St Denis D'Oleron, Royan, Rade de Pallice, Boyardville, La Rochelle and Port des Minimes. Tidal stream diagrams. 2017 Edition updated throughout, with fully updated lights and buoyage in Rade de la Pallice, Pertuis de Maumusson and the approaches to La Gironde. In addition, a new plan of Port Médoc has been added to the chart.